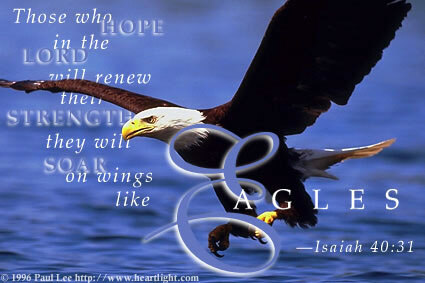 I hope everyone had a fabulous Christmas, and that the New year will bring blessings. We have been incredibly busy these past couple of weeks due to the holidays and also business related stuff. The last half of the afternoon today was taken up with counting inventory for our Eagles Wings Quilts Canadian English Paper piecing supplies web site. 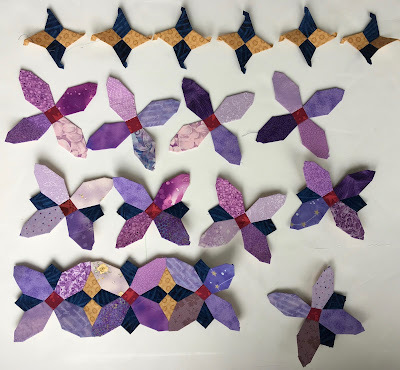 In addition to that, we also had to count all the different cones of thread and all the quilt batts I have on hand for the long arm business. The counting is done. Now comes the task of converting the cost of what I bought in US dollars into Canadian dollars and then adding it up. But I don’t have to do that today. I just wanted to make sure we went into the New Year tomorrow with an accurate inventory count. The rest of today is going to be spent working on my long time friend Leo. Or at least it feels like it’s been a long time. In reality I started this project back in June of this year, so I’ve only been working on it for 6 months. Considering the size and complexity of it, that’s not bad. I’m still working on the fourth border. It’s the one with the most pieces and also the most complex piecing, so it’s taking me longer than I had hoped it would, but it is making good progress. The third of the sides just needs its bottom small triangles added and then I can sew it to the main body. And I have most of the parts I need for the fourth side well under way. Another couple of weeks should do it. Here’s what it looks like with that third side of the fourth border laying beside the rest of it. 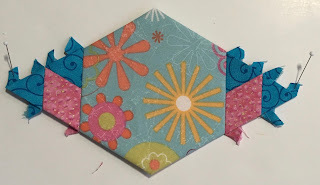 The fifth and final border is much less complex that this one, so I’m hoping it will go much faster. I’m linking up to Kathy’s Slow Sunday Stitching and then will be spending the rest of this last day of 2017 quietly stitching. I want to wish everyone reading here a very Happy New Year! As usual, I’m plugging away at Leo’s Mane. I love the project, and the way it is coming together. 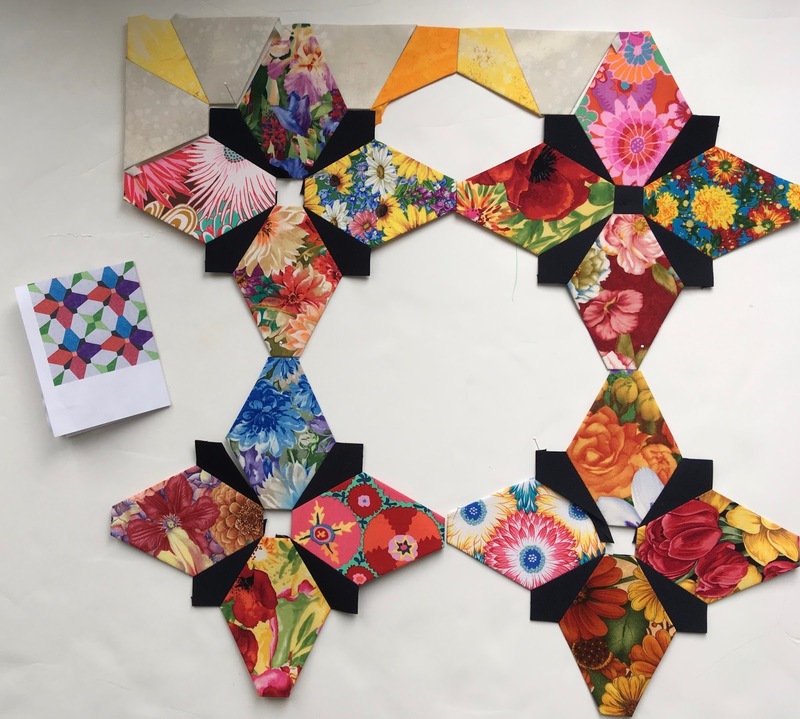 Here are more parts for the fourth border. I’d say I’m almost 2/3rds of the way finished this particular border. I’m making the individual parts, and the slowly sewing them into the border. I need to get most of the purple units done so I can get an even distributions of the colours. Every now and then I need something that isn’t quite so small and fiddly. This next project has been around for a while but I don’t know if I’ve ever actually taken a picture of it and shown it here. 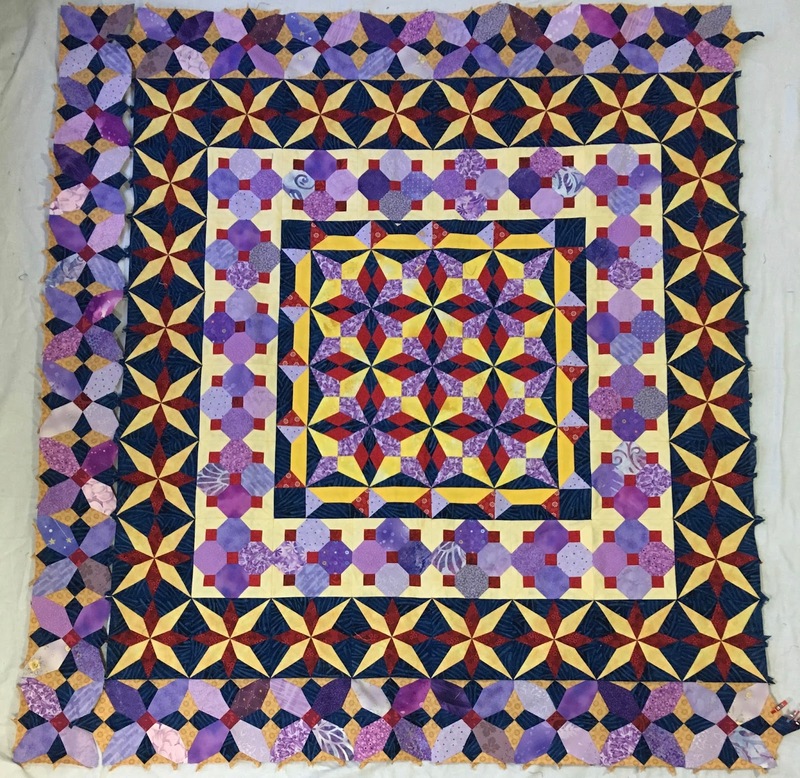 It’s a public domain design from EQ7 called Sapphire Net, and it’s a perfect candidate for English Paper Piecing. The octagon shapes are 5 1/2 inches long, and are perfect candidates for using up some of my large scale floral stash I have hanging around here. So far it measures 24 inches across. Whether I make it any bigger than this or not is yet to be determined. There will eventually be papers and pattern available for this in our web store. I’ve been working on it this week when I get tired of Leo’s tiny pieces. I’m linking up to Kathy’s Slow Sunday Stitching, before going back to more stitching. First off, I want to acknowledge the comments I received last week, and thank you for them. For some reason, they did not get sent to my email where I could answer them. I’m not sure if it was a problem with blogger or a problem with my email. I’ve changed the email address where they will be sent and hope that will fix the problem. If you don’t hear back from me it will be because either the problem wasn’t fixed by changing the email or because you have your setting at no-reply. I’ve set Leo’s Mane aside for the week while I worked on a smaller project. 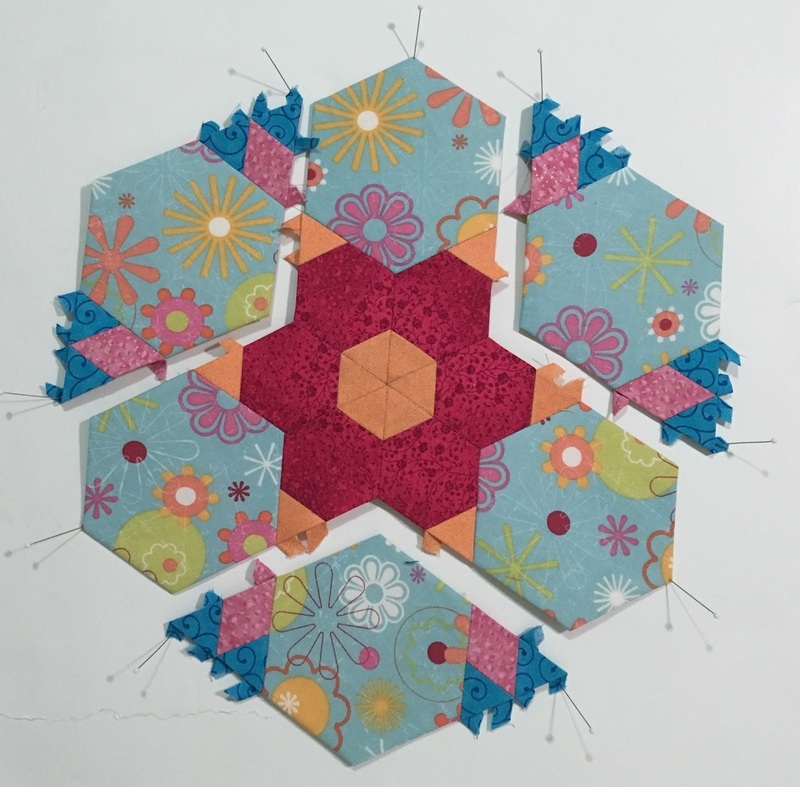 I have a friend who has designed lots of pieced hexagons, and she is giving the designs away for free on her Facebook page Hillbilly Quilt All Free EPP. If you join her group, you can access the designs. She has given me permission to sell the paper kits for these designs on our website. So, I am going to slowly attempt to make one of each. That’s what I’ve been working on this week. which got put together into some of these. Which finally resulted in this. The sides will be six inches each when it is finished. I am hoping to finish this today, and then get back to Leo. I’m finding that he is such a big project, that I need to add in some smaller faster ones every now and then. I’m linking up to Kathy’s Slow Sunday Stitching and then it’s back to my lovely stitching. I’ve made good progress this week. Last week my second length of the fourth border for Leo’s Mane looked like this. It had three stars and three of the lantern type units finished. 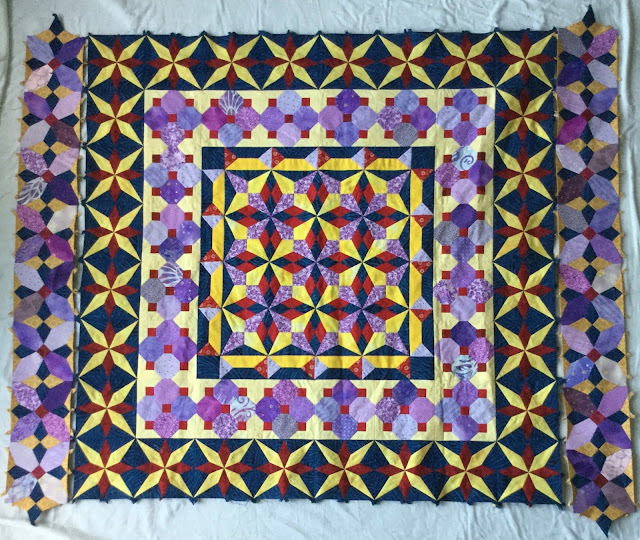 This week the entire border is now finished. Two down, two to go and then I move onto the last of the borders. As I progress through the quilt the borders are taking longer to do, since the quilt is getting bigger. These two took me a month to make. That’s something I need to keep in mind for writing up the sew along instructions. The instructions are released twice a month, so I’m attempting to divide the steps up to take that length of time. 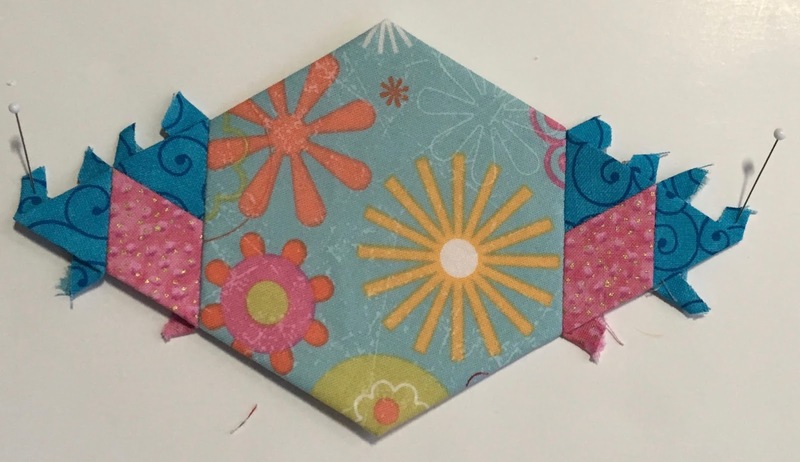 I haven't yet decided today whether I’m going to sew these two sides in place, or whether I’m going to continue making more units. 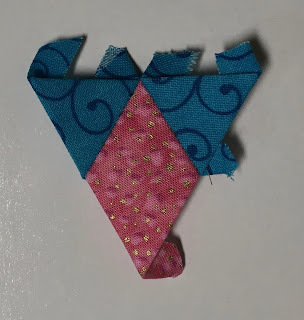 However, my brain is kinda fuzzy today, so maybe the simple sewing these borders in place should win out. Yep, I just decided, that’s what I’m going to do. 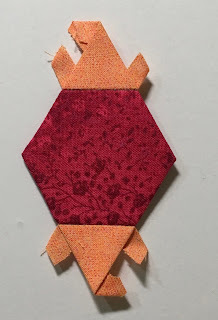 So, after I link up to Kathy’s Slow Sunday Stitching, I’ll get started on sewing these borders into place.